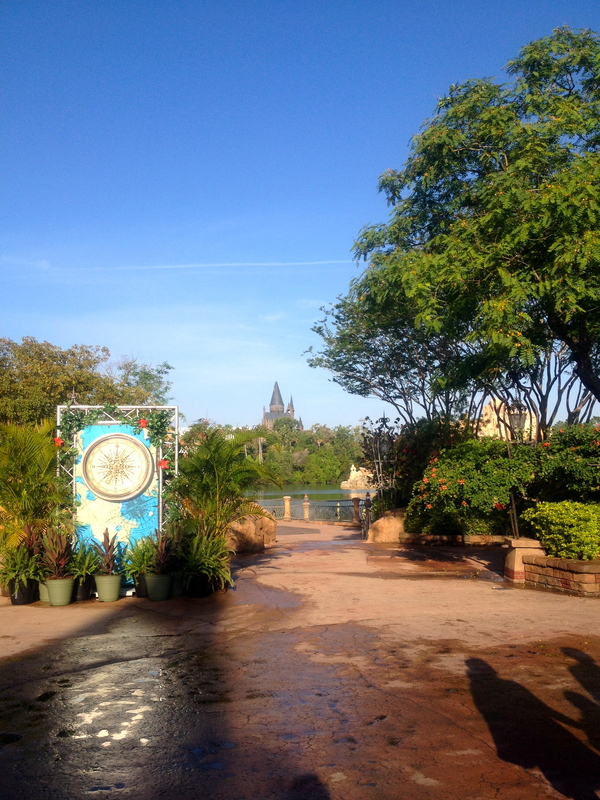 Day Two, Part One: HARRY POTTER WORLD! On the second day of our vacation, we woke up at 6:30 in order to get a head start on things. We weren’t entirely sure about directions or what to do when we got to the park (we had to find the will call kiosk), so we left our hotel an hour before the park officially opened. That ended up being a good idea, even though we were just 10 minutes away. We weren’t rushing and had plenty of time to figure things out and formulate a plan! 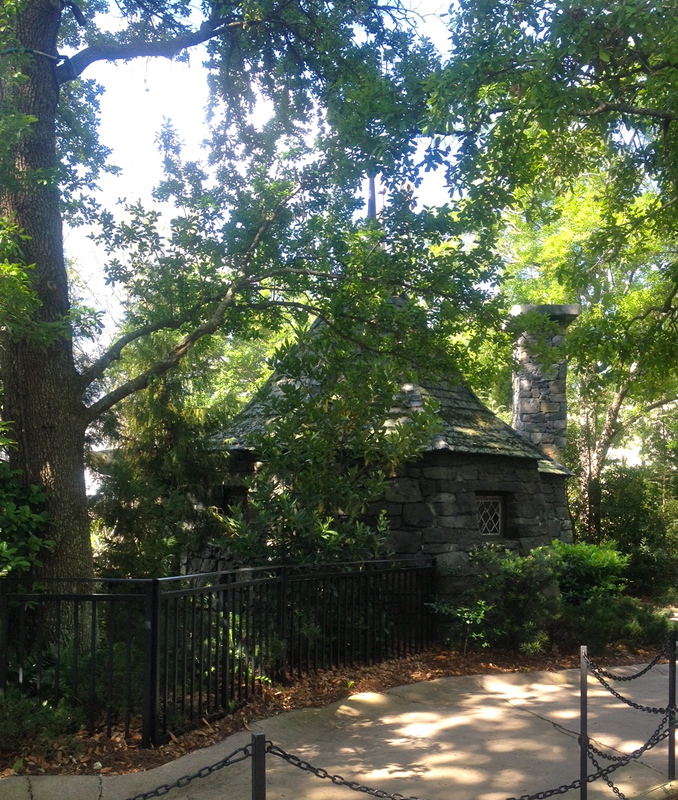 When we got there, we easily spotted the kiosk, printed our tickets, and jetted off to the back of the park. 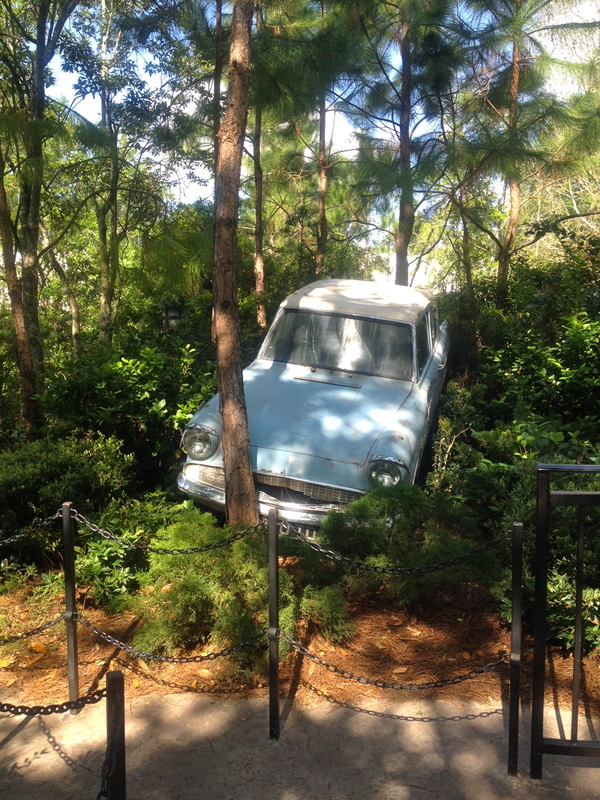 The Wizarding World of Harry Potter is located in the back of Islands of Adventure. 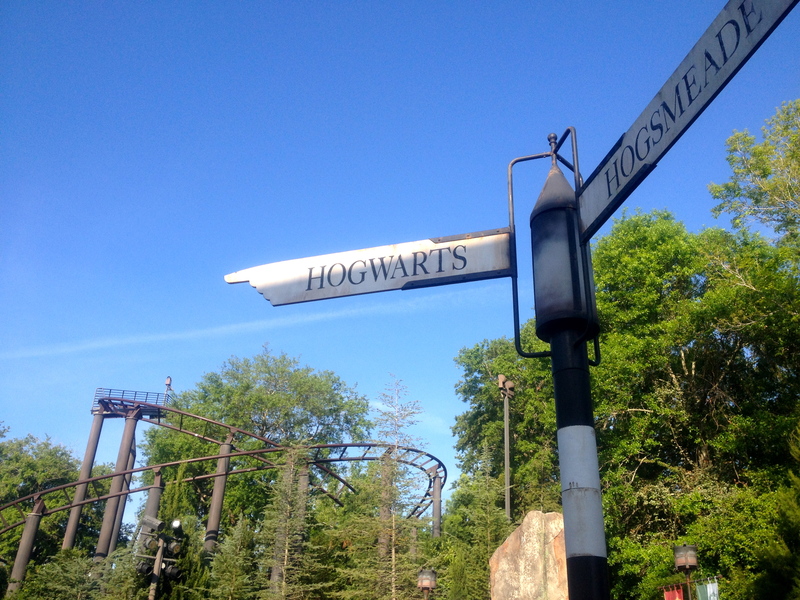 I had done a bit of research before we left and learned that, time-wise, it is important to get to Hogwarts first thing in order to avoid lines. Don’t have to tell me twice! How could a Harry Potter freak fan not be excited about that?? 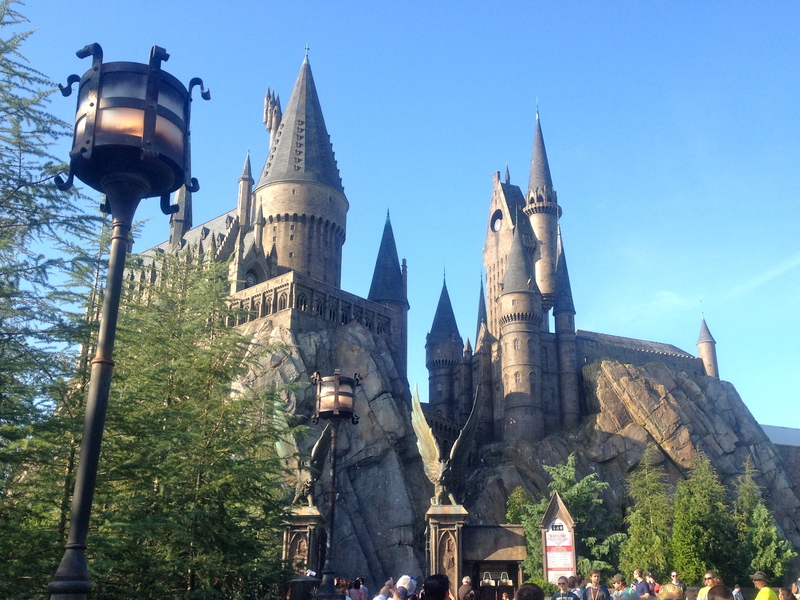 Time for a little tip: if you go to HP World, get to the park early and make your way to Hogwarts as fast as humanly possible. Apparition is the preferable mode of transport, but if that’s not your thing, just use your feet! Ok, I know this entire post has been me talking about rushing around, but once you get to the castle, it is imperative that you take a moment and think about exactly where you are. They make it easy to do this: the soaring soundtrack music is playing, ravens are cawing overhead, and the castle looms comfortingly above you. 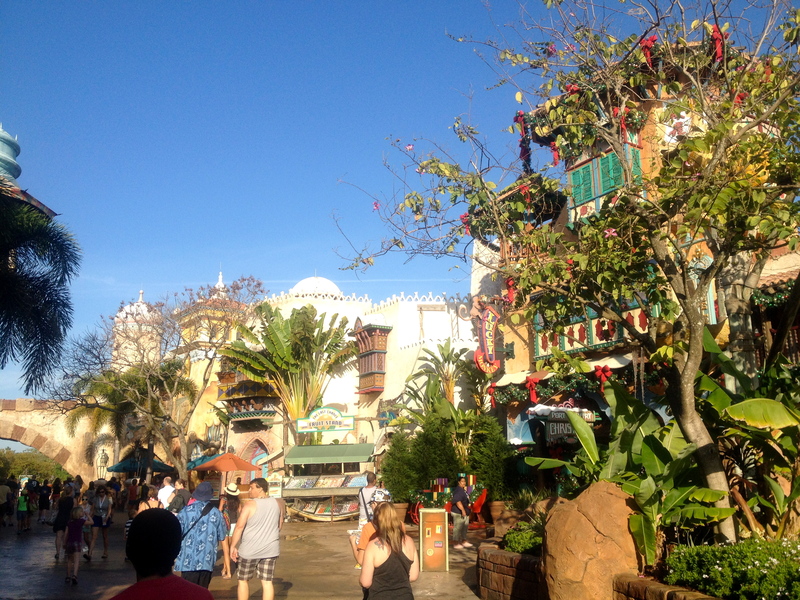 Plus, in true Orlando theme park fashion, they keep the line itself very interesting! Enter more freaking-out, labeling everything, recalling-chapters-from-the-books, fangirl moments. 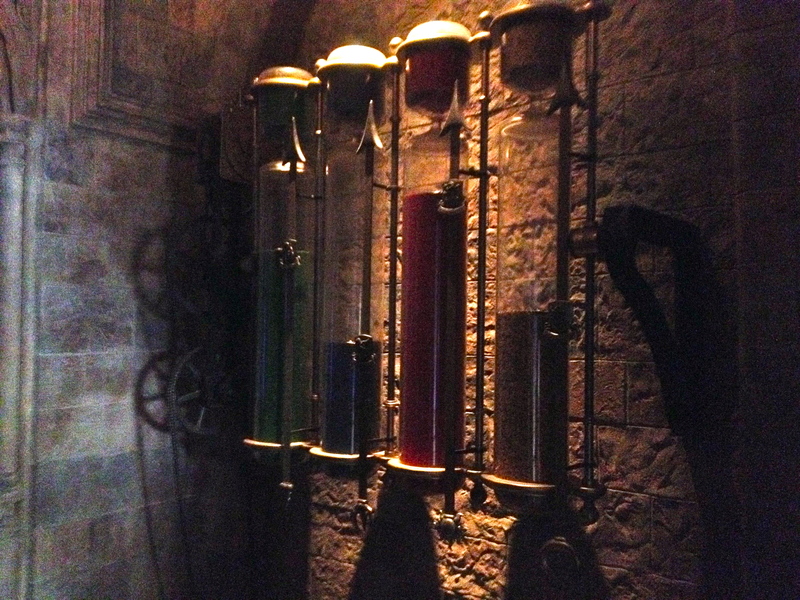 The way up to Dumbledore’s office! I’m so glad my phone was able to take these pictures inside. Beyond this point, it couldn’t pick up anything in the darkness, but for our viewing pleasure, someone has uploaded the entire ride (in video form) on Youtube! Check it out here! 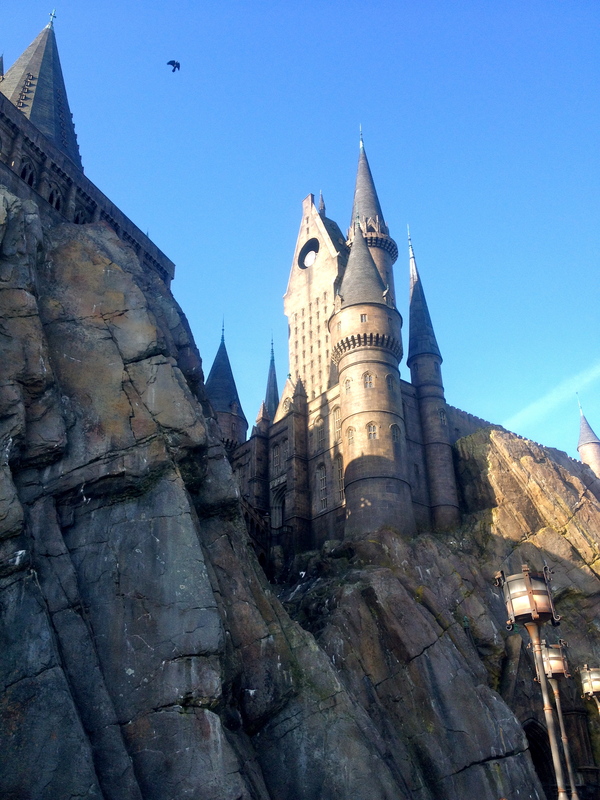 My mom and I were actually extremely lucky the first time we went on The Forbidden Journey. We were waiting in line when a worker asked for two riders. We volunteered, having no idea what we volunteered for, and followed the worker (who, by the way, called us Muggles) for a bit. She then left us at a doorway and gave us some directions – go down this hallway, get on the elevator, go up a floor, go across another hallway, and go back down a floor. That part felt just weird. 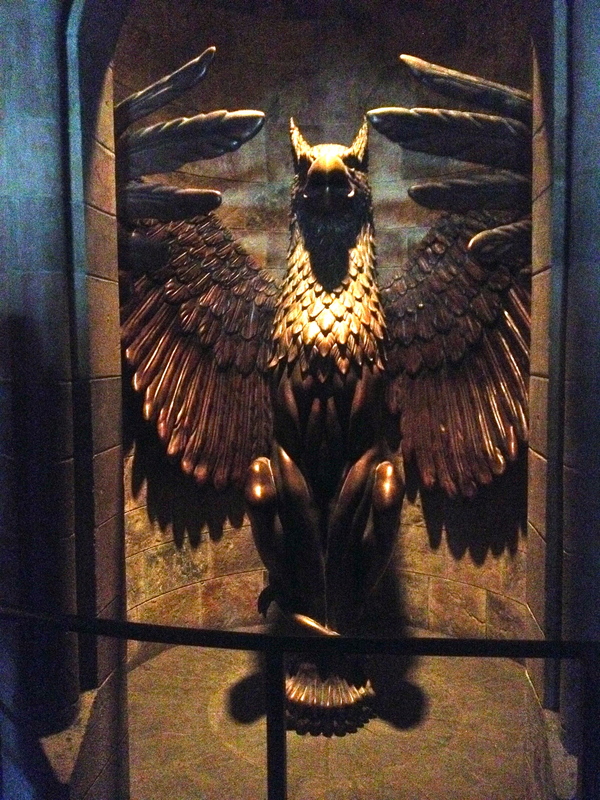 There we were, wandering the hallways of Hogwarts. I was seriously impressed that they kept the theme going throughout – it didn’t change back to normal, boring walls once we exited the main line. 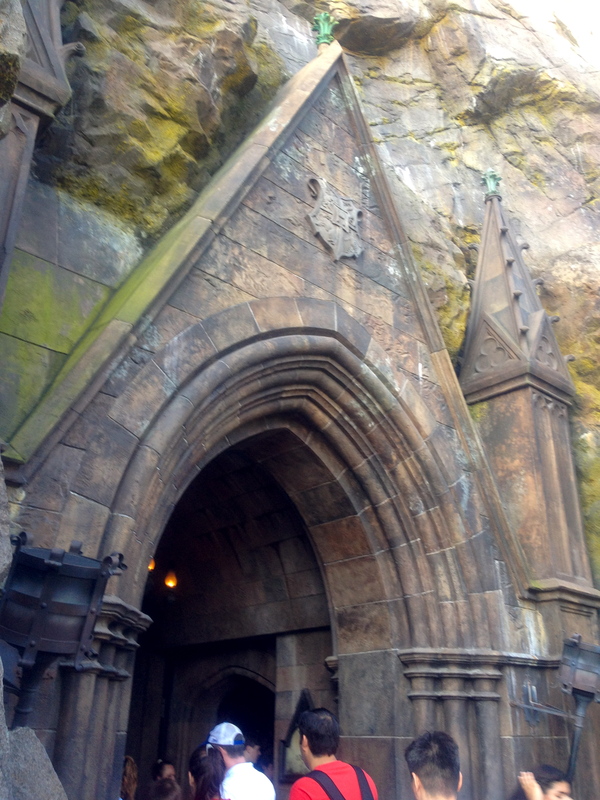 The walls were still made of stone and the doorways were beautiful and ornate. 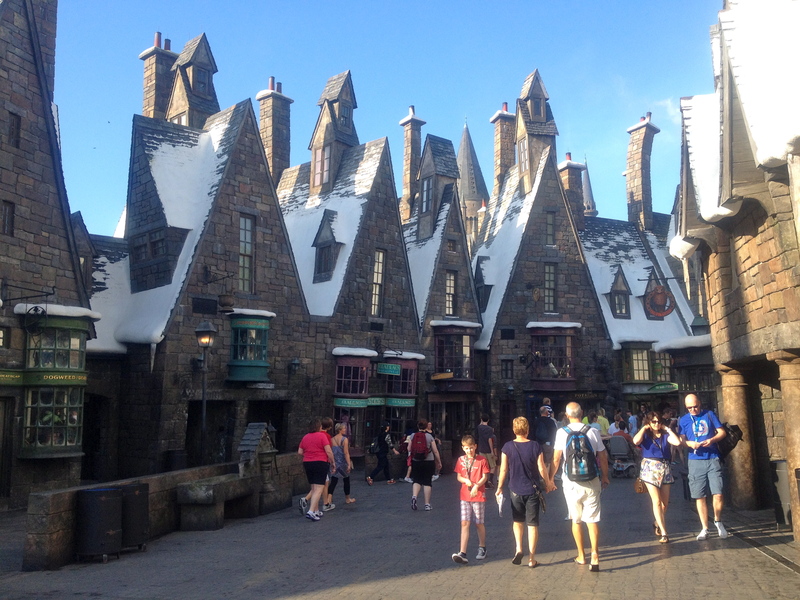 And then went to explore Hogsmeade. 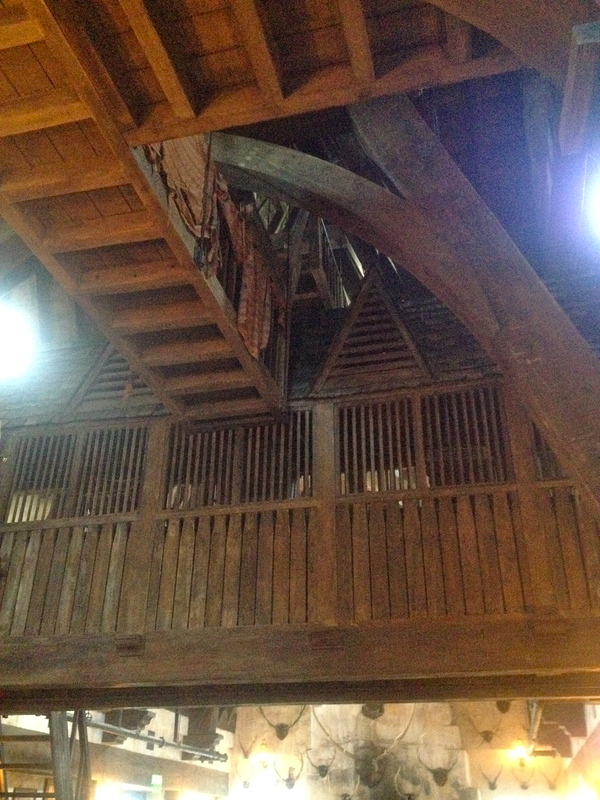 We took a moment to duck into the Three Broomsticks to take a look around. 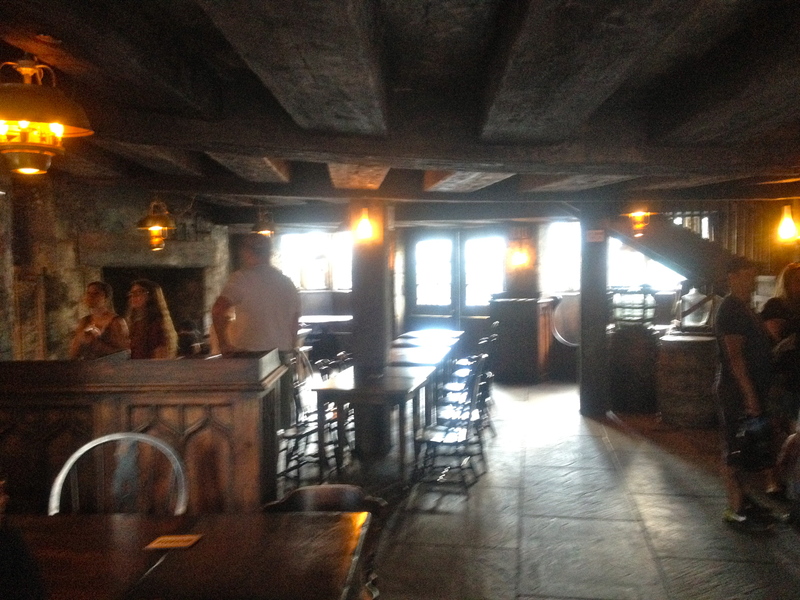 I was pleasantly surprised to see that it looked very much like an English pub. 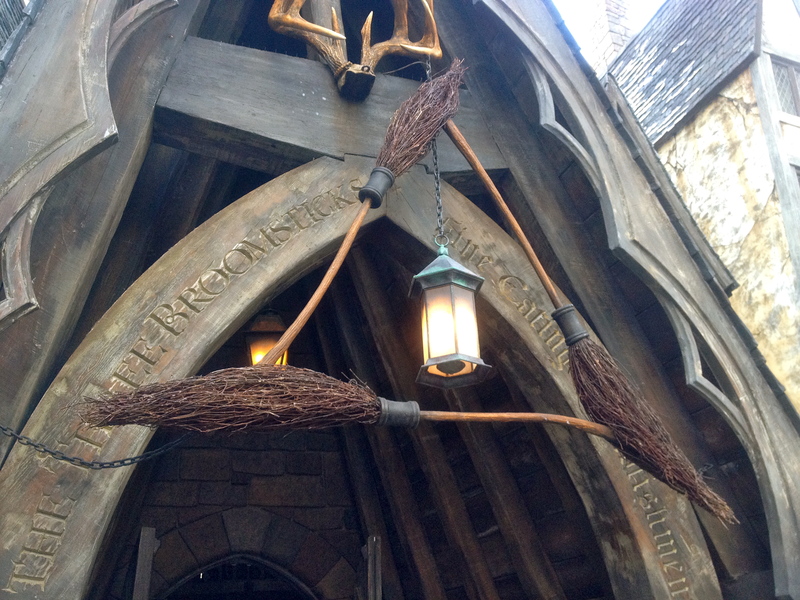 And not only that…it looked just as the Three Broomsticks should. 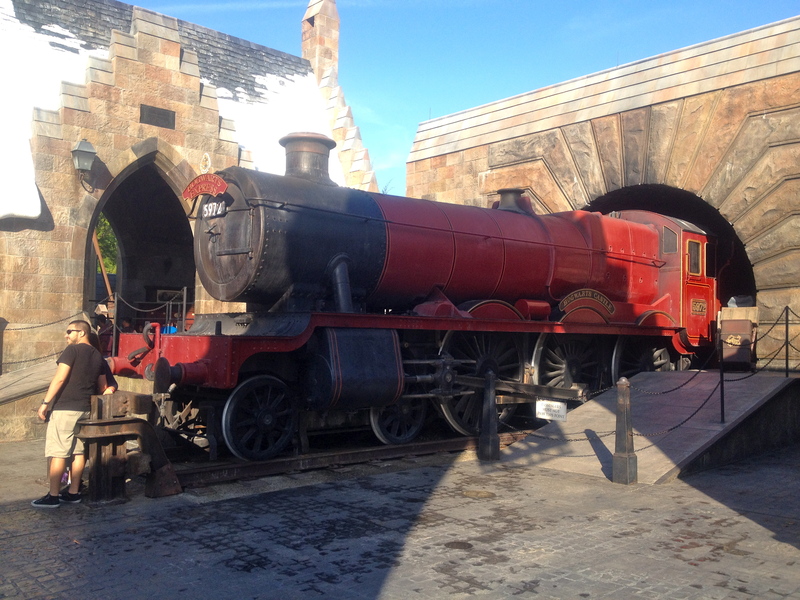 Hogsmeade has two butterbeer carts. 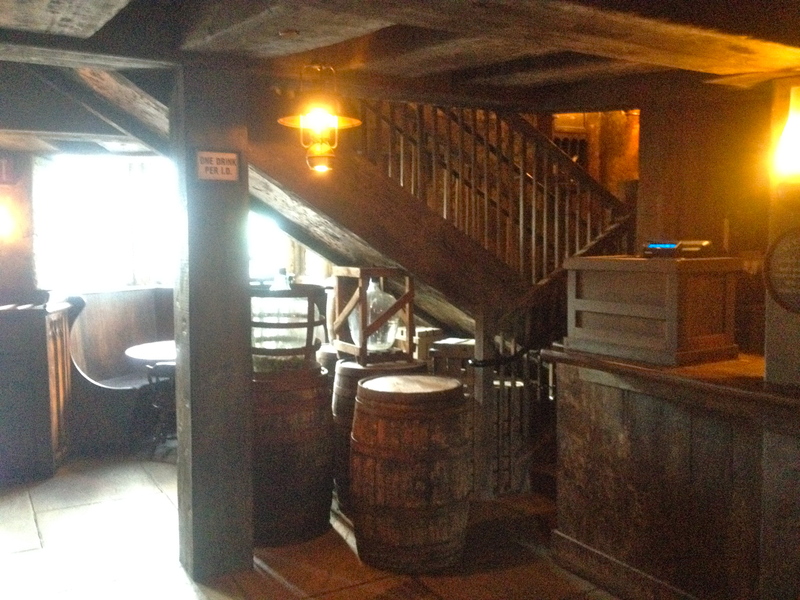 You can also buy a frothy mug in the Three Broomsticks, but as the line was shorter at one of the carts, I ordered some outside. 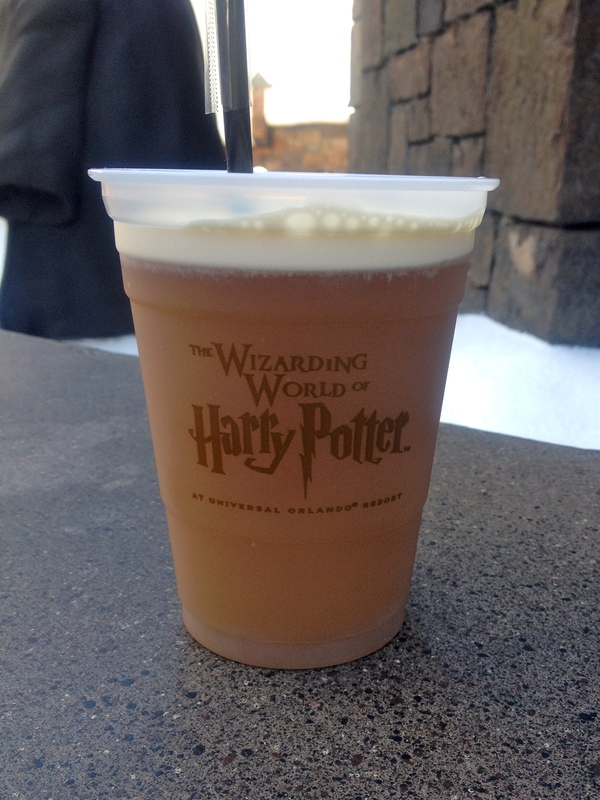 You can get the butterbeer regular or frozen, and I highly recommend the frozen kind. Especially if Florida decides to be 91*F and exceptionally humid the day you’re visiting. 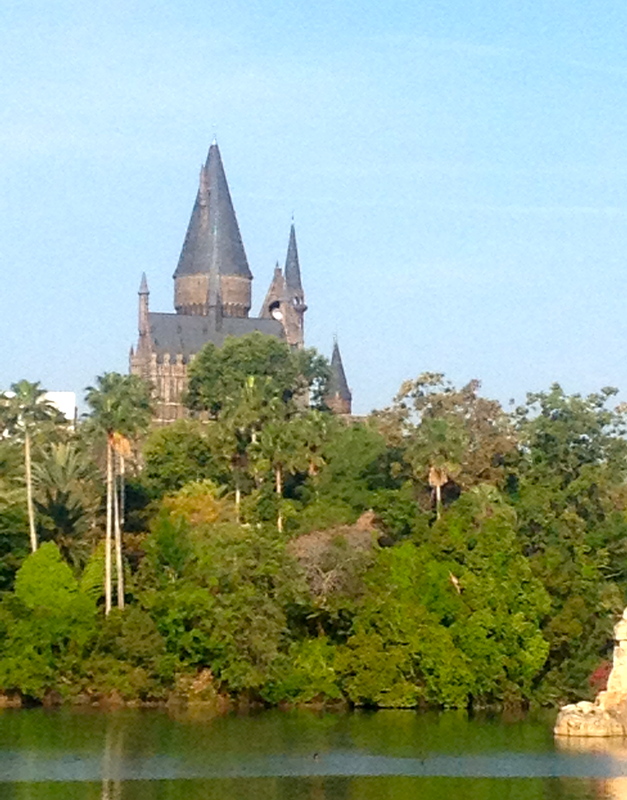 There are two other rides at HP World: the Flight of the Hippogriff and the Dragon Challenge. 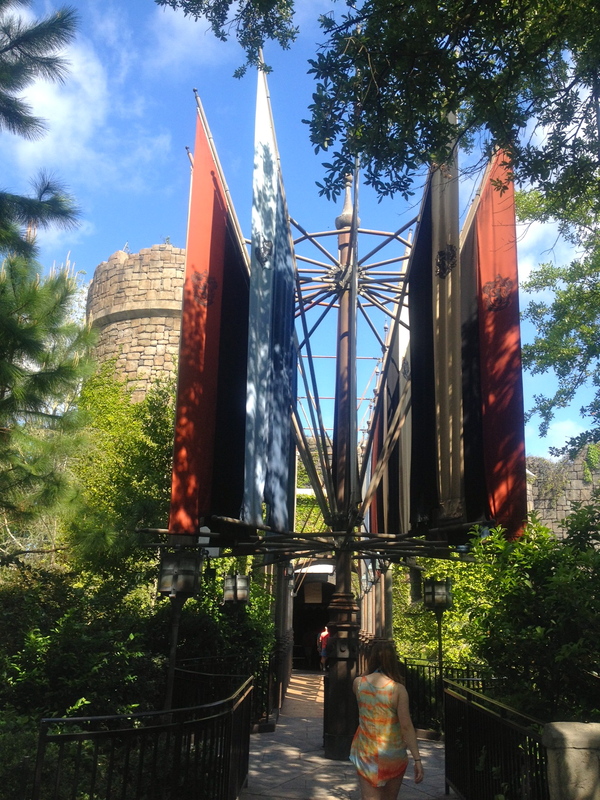 The Flight of the Hippogriff would be good for littler ones (or those who aren’t fans of rollercoasters). 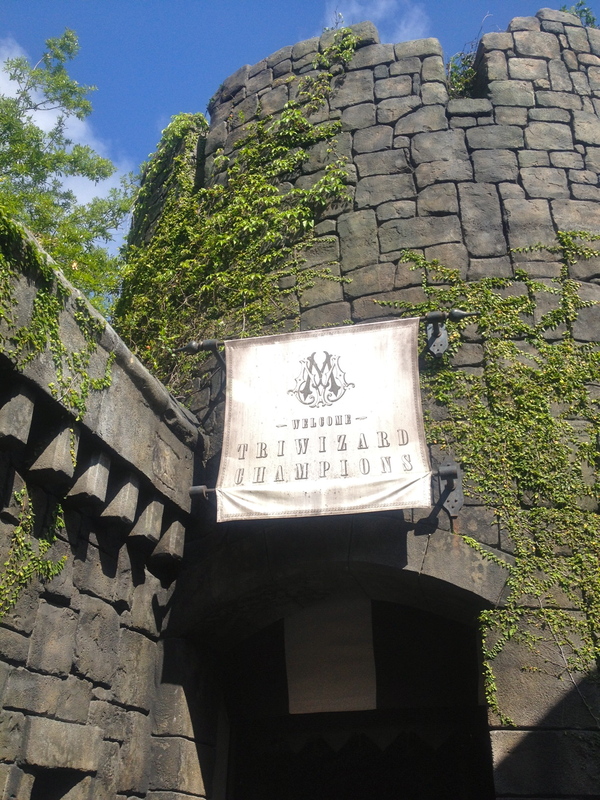 The Dragon Challenge, on the other hand, was awesome. Definitely my favorite coaster in all of Universal! 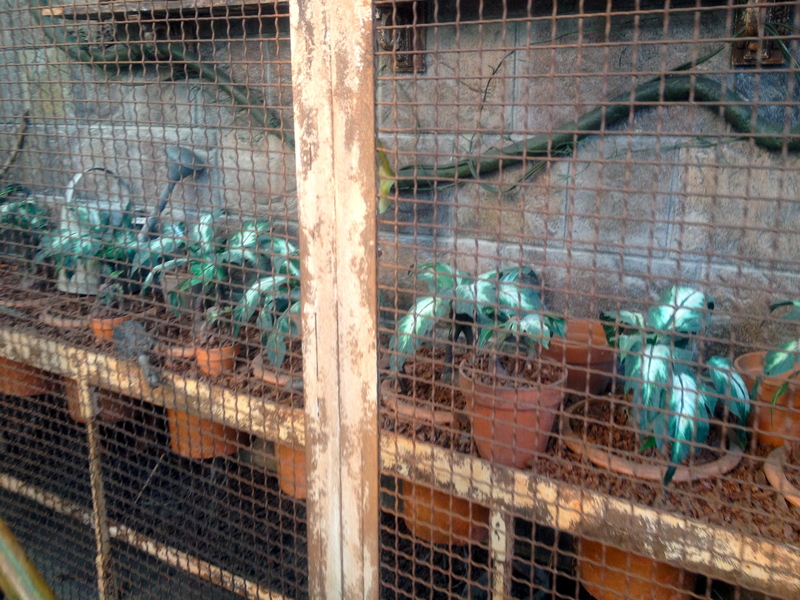 It is set up as if it’s a part of the Triwizard Tournament. You chose from one of two dragons: red (fire) or blue (ice). Personally, I like the red dragon better. And you get lovely views of the castle, as well. For lunch, we headed back to the car. We had packed food the night before and stored it in a styrofoam cooler. We also had covered parking, so everything stayed nice and fresh. Plus, we didn’t have to pay and arm and a leg for unhealthy theme park food! 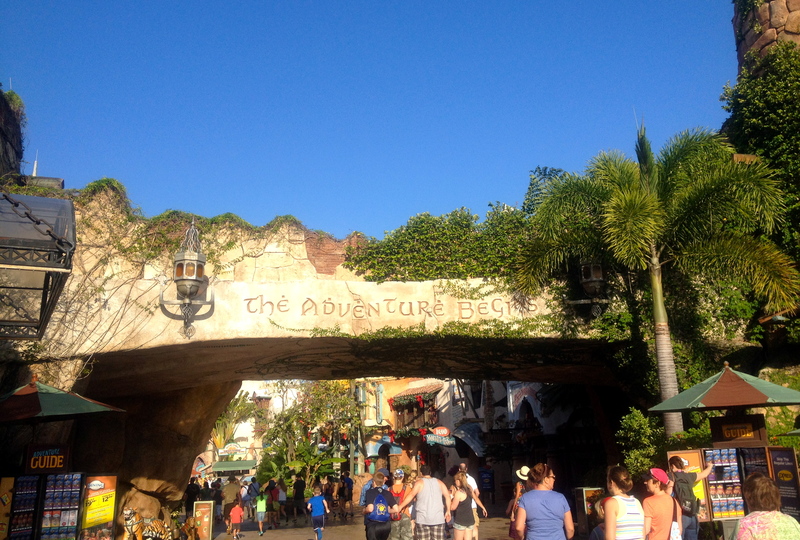 After lunch, we went around Islands of Adventure (again, I’ll write about that in my next post) before ending up back at HP World. I just couldn’t get enough! 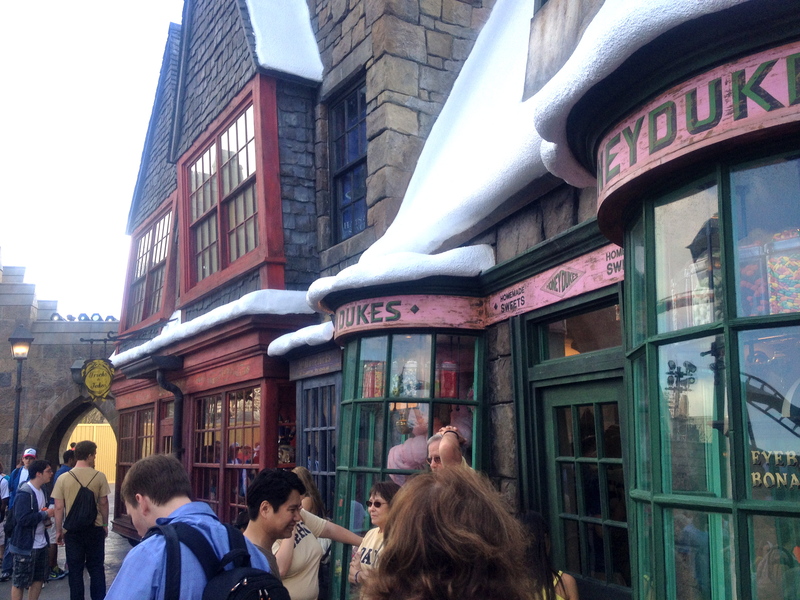 We decided to go ahead and wait in line at Ollivander’s Wand Shop. 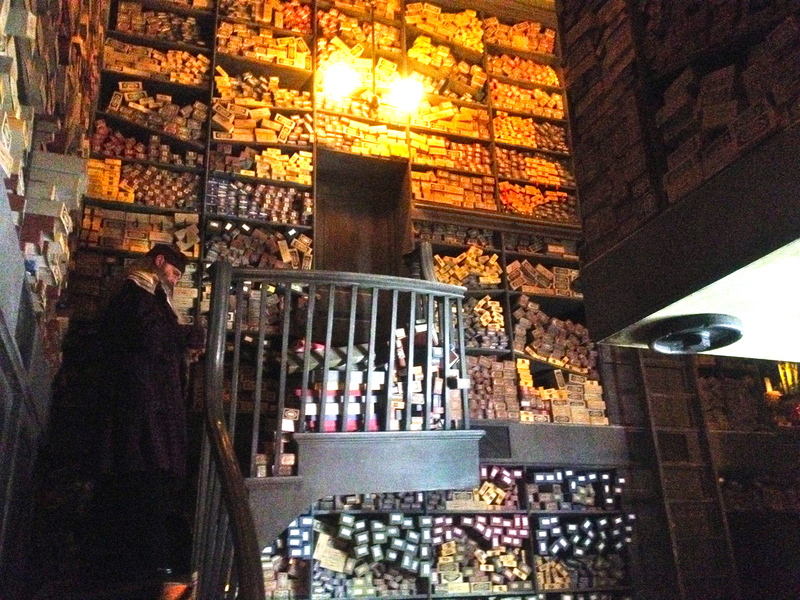 The wizard – Ollivander – gave a small group of us a little lecture about wands, before choosing a special witch to try out a few. It was just like the scene in the book/movie when Harry gets his wand! 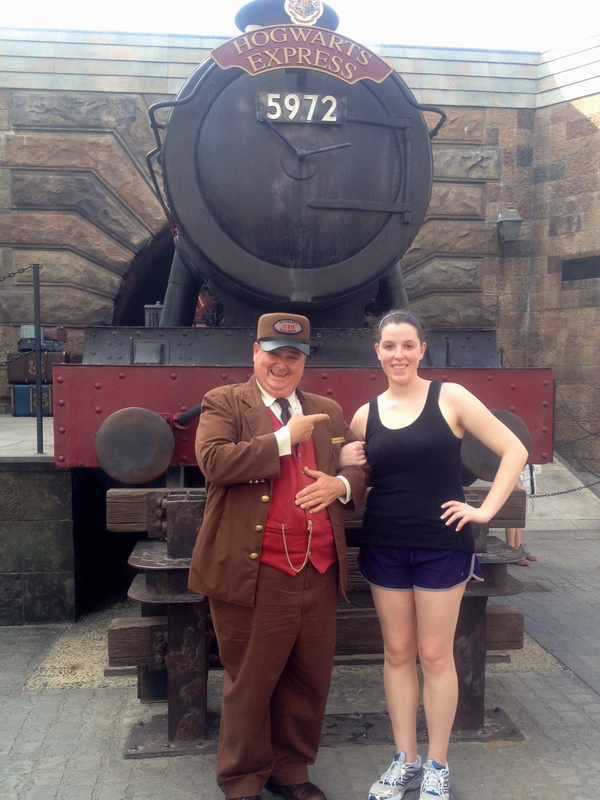 Before leaving the park for the day, we stopped for a photo with this chap…the conductor of the Hogwart’s Express! I really liked this guy. He had a pretty thick British accent, but when I asked where he was from, he answered “Hogsmeade!” with a look of absolute surety on his face. 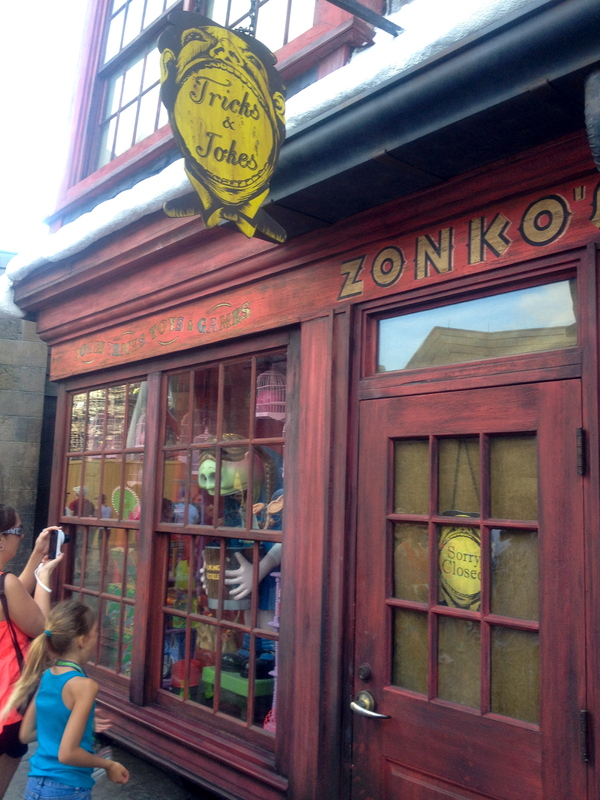 I loved that about this place: everyone was constantly in character, which only added to the atmosphere. 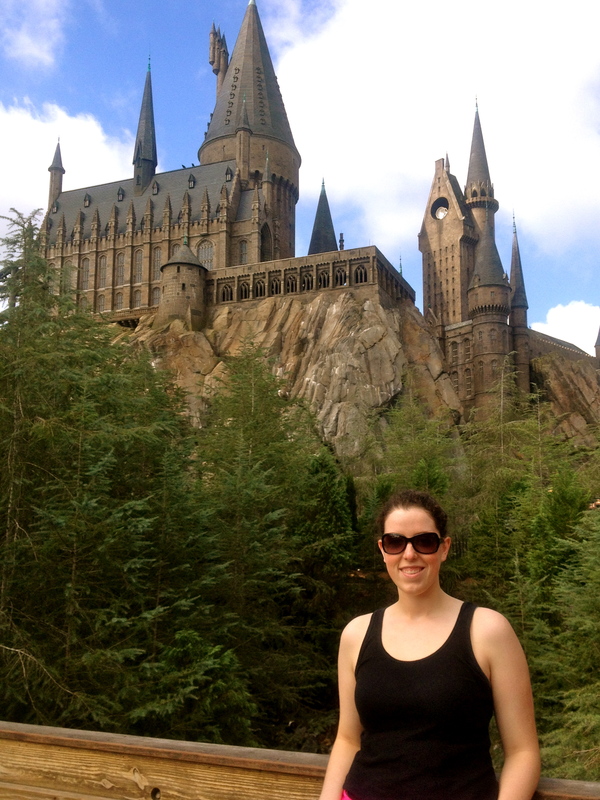 And that was my first day at the Wizarding World of Harry Potter. It was surreal, to say the least. 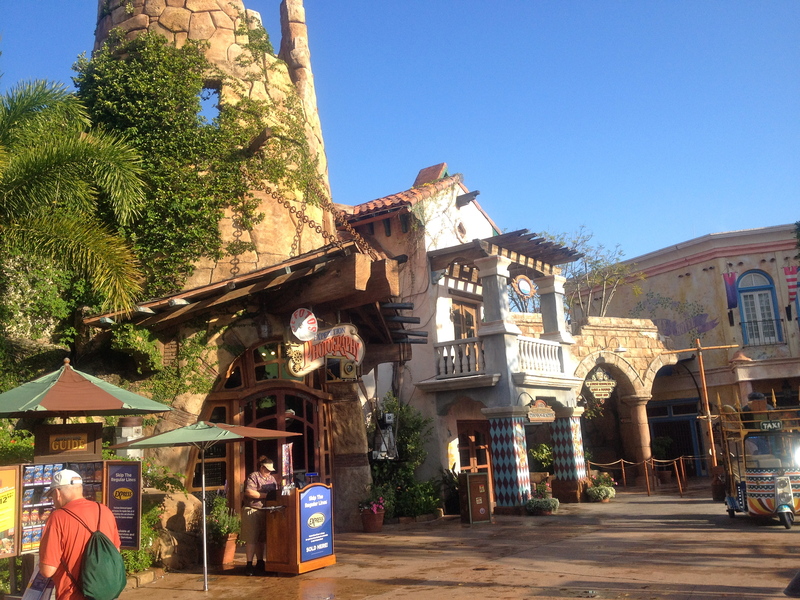 Check back soon for Part Two of Day Two at Islands of Adventure! Are you a Harry Potter fan? If not, what’s your favorite book series? Are you a roller-coaster person? Hahaha my friends were just talking about this place over the weekend! I’ve never been but it looks fun! 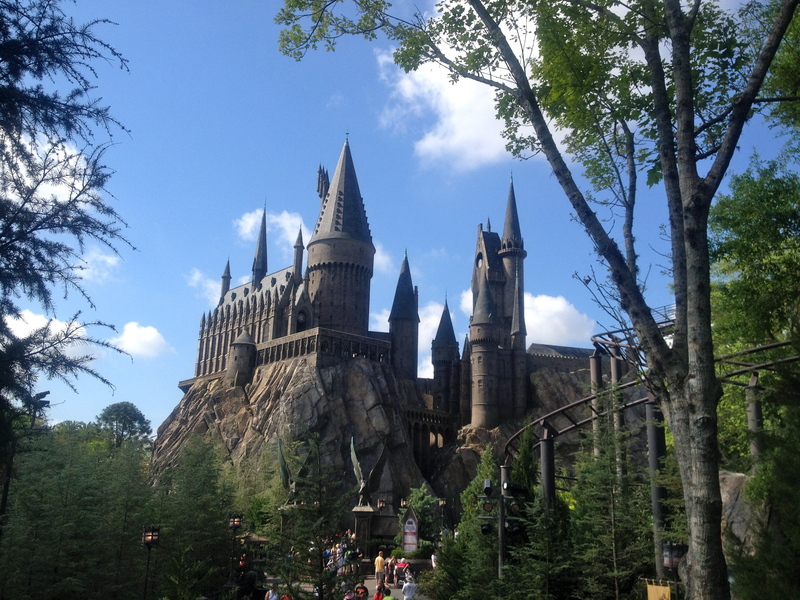 Love love love Harry Potter world! And that ride is amazing. That was our favourite for the whole trip. And yeah the butterbeer was so tasty but SO sweet. Wow. This is about as amazing as I imagined. Thank you youtube! I’m about to go watch the ride clip now. Yay! That was my goal! I thought at first that the post would be wayyyyy too much in terms of descriptions and pictures, so I’m happy to hear you liked it! 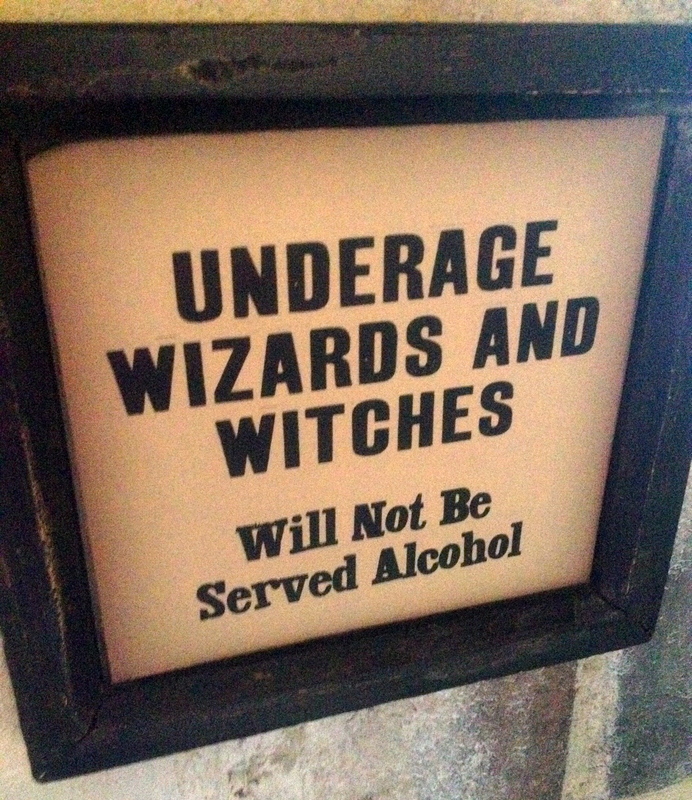 God I LOVE HP World. 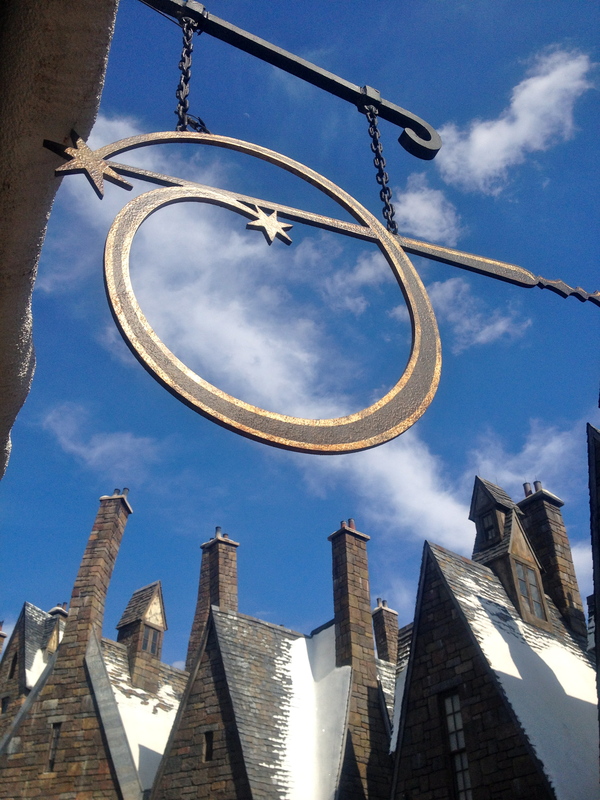 Ahh I want to go see Hogwarts and Mr. Ollivander’s shop and drink butterbeer at the Three Broomsticks! You’re so lucky! 🙂 This wasn’t too long at all, I loved reading it. 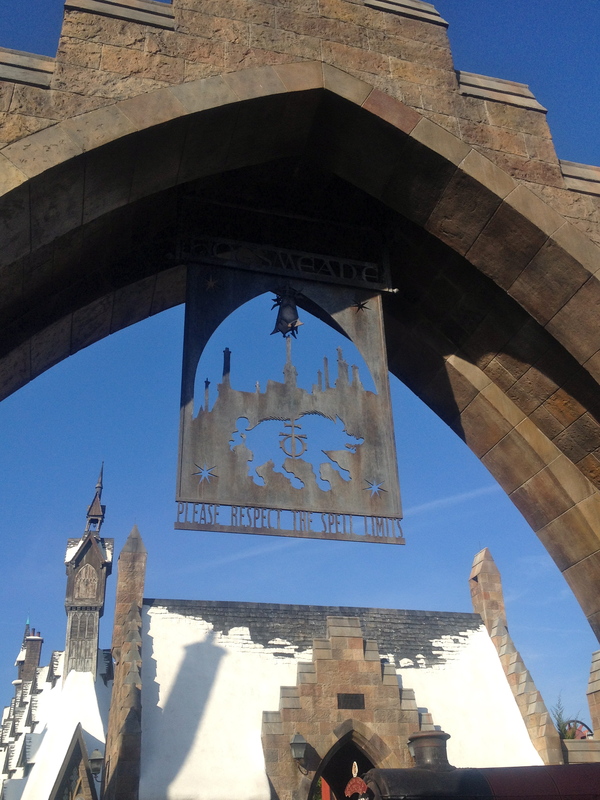 Question: would you say that HP World is based more on the books or the movies? 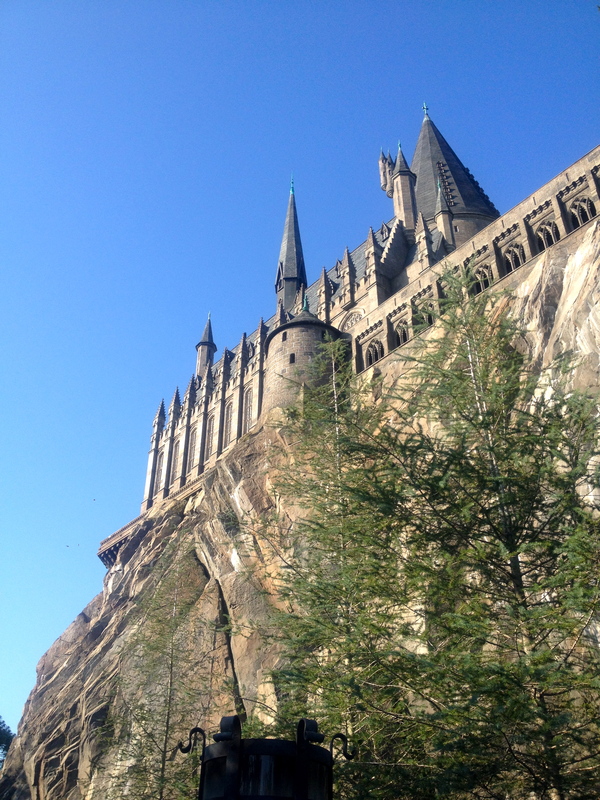 I tend to regard the books and movies as two separate entities, because so many amazing details were left out of the movies that it usually frustrates me when I watch them- but I think I would love this place, regardless!